This midrash is not about what you would expect: Balak, Bil'am and his donkey, but about a very urgent subject: kashrut! Is it only about food? No, as we learn from the midrash. We observe kashrut to a bigger or a smaller extent, and we all agree: pork is the symbol par excellence of all that's not kosher. But how careful should you be? 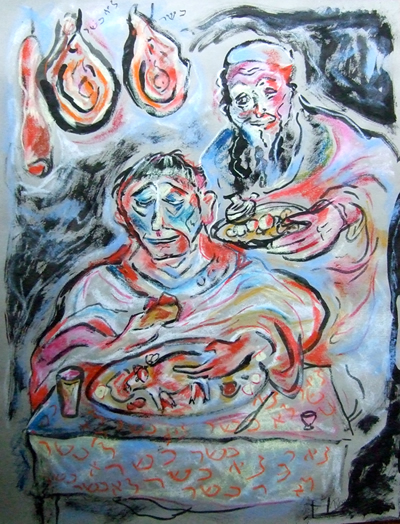 In this story the man who did not wash his hands and was lax with a mitzvah de-rabbanan (instituted by the rabbis in the Talmud), which some people consider less important, was taken for a non-Jew and fed....pork, which is perfectly OK to eat for gentiles, to his horror. It was his own fault. He might be not so careful and he appeared to be very assimilated, probably wore gentile clothes and a gentile hair style as well, but he did not intend to go as far as eating meat from a pig! This reminds me of the following story, which happened a few years ago here in the USA. Traditional rabbis insist that we only buy products that have a hekhsher, a certificate/symbol that it has been inspected and is really kosher and made in kosher pots and equipment, like the OU symbol on cornflakes. Some products are therefore more expensive, other products have no hekhsher, because the manufacturer does not care, or finds the inspection and certification too expensive and not worth it for only a small group of customers. There are Jews who say: "What could be wrong with x or y, which is naturally kosher (made of kosher ingredients) anyway, what could go wrong?" Well, everything! There was a brand of maple syrup, it had no certification. It said on the label: pure maple syrup, no additions, coloring, preservatives, etc. So far, so good, yes, that syrup is kosher. But...it was found out that this syrup was transported through pipes before it was bottled. In order to make them smoother, they were smeared with lard, the fat of a pig! This was not put on the label, of course, why should it be? And why should the gentile manufacturer see anything wrong in doing that? So how kosher was this syrup? Beware! The moral of the story is: whatever your level of observance, you must always be careful, it might not be what it seems. Bil'am blessed the Jewish people because they took upon them to do mitzvot and observe the Torah. Reading this midrash we learn that we have to be so careful with both the 'big' and the 'small' mitzvot to deserve this blessing! Otherwise we end up with swine on our plate, and you don't want to be what you eat! So many midrashim, so much to learn! And just when you thought you were getting the "hang" of things, two twists in one week: a new kind of midrash, and two entirely different ways of understanding it. All I can say is - Wheeee! Sometimes a midrash addresses a matter of law, or halachah, as does this week's midrash. It still helps to understand what is happening in the portion, however. In this case, Balaam is standing before the nation of Israel, and about to bless them with the words that form part of our morning liturgy: "Mah tovu ohalecha, Yaakov, mishk'notecha, Yisrael" - How lovely are your tents, O Jacob, your dwellings, O Israel! The sages weren't too happy about an "idolater" speaking with G!d and getting to give such a rich blessing, which is at least in part the reason for this midrash. But first, a word about observance. As M' Shoshannah notes in her sidebar, we all choose levels of observance, and neither she nor I would want to tell people what they should or should not observe. But it helps to understand what is going on by reading the midrash "as if" one were fairly observant in their practice. That disclaimer being offered, let's proceed. Halachah: If a man has eaten without previously washing his hands, does he incur a penalty? Our Rabbis have taught: Washing the hands before a meal is optional; after a meal it is obligatory. An incident is related that during the period of religious persecution a certain Israelite shopkeeper used to cook ritually clean meat as well as the flesh of swine and sell them, so that it might not be suspected that he was a Jew. His practice was that if anyone came into his shop to eat and did not wash his hands, he would know that he was an idolater and would place before him the flesh of swine, but if a man washed his hands and recited the blessing he would know that he was an Israelite and would give him clean meat to eat. Once a Jew came in to eat and did not wash his hands, so he thought that he was an idolater and placed swine's flesh before him. The man ate and did not say the Grace after Meals. When he came to settle the account with him for the bread and the meat the shopkeeper said to him: 'I have a claim on you for such-and-such a sum on account of the meat you have eaten, for each piece costs ten manehs.' Said the other: 'Yesterday I got it for eight and to-day you want to take ten from me, do you?' The shopkeeper answered him: 'The piece you have eaten is from the swine.' When he told him this his hair stood on end, and he fell into a great fright and said to him under his breath: 'I am a Jew and you have given me swine's flesh!' Said the shopkeeper to him: 'A plague on you! When I saw that you ate without washing your hands and without a blessing I thought you were an idolater!' Hence the Sages have taught: The neglect of the water before the meal led to his eating the flesh of swine; that of the water after the meal killed the soul. Each of us, try as we may to do otherwise from time to time, lives at the center of the universe. We see the world through our own eyes, we know that what we know is correct. While we carry the intellectual understanding that others may have a different opinion, or that they actually see the world in a different way, this is a difficult perspective for us to maintain for any lengthy period of time: we just don't seem to be "wired" for it. I have never seen this condition rendered as eloquently as I did on one teenager's t-shirt at the state fair: "As a matter of fact, the world does revolve around me!" Cute, but oh so true. The moment of revelation is world-shattering for each of them: things are not what they seemed; what is true is false; assumptions are shattered and expectations fail. These moments, in the most extreme of which we question not only what we know but who we are, are extremely rare and extremely powerful - and decidedly unsettling. In fact, Gregory Bateson, the cyberneticist who studied how complex systems learn, called this "Level III learning" - which he described as "spiritual experiences." How do we approach and attempt to understand these moments? Certainly with awe and trembling - we are, indeed wired for these responses. But what about our attitude: will we embrace them, ready to let a new "us" emerge from the encounter? Or will we recoil from them, crying "sin!" and "foul!" and wrapping the old and familiar around us as tightly as we can? Our instincts, our "wiring," will encourage us to the latter. But I believe our souls, that spark of the Divine that resides within us, will lead us to the former - and to new worlds, as yet unknown and unseen.